Enthusiastic Welcome to Cuban President in Namibia | Cuba Headlines – Cuba News, Breaking News, Articles and Daily Information During this landmark visit, the Cuban President will hold official talks with President Pohamba and will pay a courtesy call on Founding Father, Dr Sam Nujoma. He is also expected to lay a wreath at Heroes Acre this morning before his departure at noon. "> During this landmark visit, the Cuban President will hold official talks with President Pohamba and will pay a courtesy call on Founding Father, Dr Sam Nujoma. He is also expected to lay a wreath at Heroes Acre this morning before his departure at noon. Amid pomp and splendour, the Cuban President Raúl Castro Ruz arrived in the country yesterday afternoon on his first trip to southern Africa since taking office early last year. 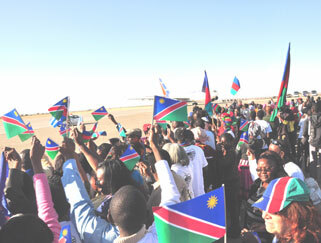 Excited Namibians turned out in great numbers at Hosea Kutako International Airport to catch a glimpse of the visiting President whose country, through internationalist forces, contributed to Namibia’s independence and end of the racist apartheid system. Treated to a red-carpet welcome, the President of the Councils of State and of Ministers of the Republic of Cuba was received by President Hifikepunye Pohamba and the Prime Minister Nahas Angula and other Cabinet ministers. Members of his delegation include Member of the Council of State and First Deputy Ministry of Armed Forces, the Army Corp General Leopoldo Cintra Frias, Vice President of the Council of Ministers Ricardo Cabrisas Ruiz, Minister of Foreign Affairs Bruno Rodriguez Parrilla and other Members of the Cuban Parliament as well as protocol. The two countries have had a long and fraternal relationship, which dates back to the liberation struggle for independence from South Africa. Since Namibia attained its independence, the two have continued to enjoy excellent bilateral relations that blossomed into the signing of Namibian-Cuban several bilateral agreements one being the agreement on the establishment of the joint commission for economic, scientific, technical and trade cooperation. That scope of cooperation was expanded further during the 10th Session of the Joint Commission of Cooperation between Namibia and Cuba, which took place in Havana last month. New areas of cooperation were identified, among them cooperation in health, youth, national service, sport and culture, education, agriculture and forestry, lands and resettlement, trade and investment, regional and local government, mines and energy, fisheries, gender equality and child welfare, works and transport, meteorology, tourism, science and technology and environment. Namibia has for years enjoyed Cuba’s support especially in the Health sector where scholarships have been awarded to Namibian students to study in that country. There are about 130 Namibian students studying in Cuba at institutions of higher learning, while Cuba has seconded over 140 doctors presently working at Namibian hospitals.